The evolution of the Greek economy during the 19th century (a period that transformed a large part of the world due to the Industrial revolution) has been little researched. Recent research examines the gradual development of industry and further development of shipping in a predominantly agricultural economy, calculating an average rate of per capita GDP growth between 1833 and 1911 that was only slightly lower than that of the other Western European nations. Nonetheless, Greece faced economic hardships and defaulted on its loans in 1826, 1843, 1860 and 1893. Other studies support the above view on the general trends in the economy, providing comparative measures of standard of living. The per capita income (in purchasing power terms) of Greece was 65% that of France in 1850, 56% in 1890, 62% in 1938, 75% in 1980, 90% in 2007, 96.4% in 2008, 97.9% in 2009 and larger than countries such as South Korea, Italy, and Israel. The country's post-World War II development has largely been connected with the so-called Greek economic miracle. 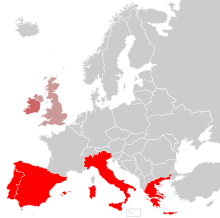 Greece was accepted into the Economic and Monetary Union of the European Union by the European Council on 19 June 2000, based on a number of criteria using 1999 as the reference year. After an audit commissioned by the incoming New Democracy government in 2004, Eurostat revealed that the budgetary statistics on the basis of which Greece joined the eurozone had been under-reported. Most of the differences in the revised numbers were due to a temporary change of accounting practices by the new government, i.e., recording expenses when military material was ordered rather than received. This method, in conjunction with the retroactive application of ESA95 methodology by Eurostat, led to a reference year budget deficit of 3.4% of GDP in 1999, leading to claims that Greece had not actually met all the accession criteria. The Greek minister of finance stated nonetheless that even the revised 1999 budget deficit was below the prescribed 3% limit when calculated with the ESA79 methodology in force at the time of Greece's application, and thus the criteria had been met. To complicate things further, the original accounting practice for military expenses was later restored in line with Eurostat recommendations, theoretically lowering the 1999 Greek budget deficit to well below 3% (an official Eurostat calculation is still pending for 1999). Greece is a developed country, with a high standard of living and "very high" Human Development Index, ranking 22nd in the world in 2010, and 22nd on The Economist's 2005 worldwide quality-of-life index. 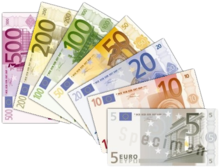 According to Eurostat data, GDP per inhabitant in purchasing power standards (PPS) stood at 95 per cent of the EU average in 2008. Greece's main industries are tourism, shipping, industrial products, food and tobacco processing, textiles, chemicals, metal products, mining and petroleum. Greece's GDP growth has also, as an average, since the early 1990s been higher than the EU average. However, the Greek economy also faces significant problems, including rising unemployment levels, an inefficient bureaucracy, tax evasion and corruption. In 2009, Greece had the EU's second lowest Index of Economic Freedom (after Poland), ranking 81st in the world. The country suffers from high levels of political and economic corruption and low global competitiveness compared to its EU partners. After 15 consecutive years of economic growth, Greece entered recession in 2009. An indication of the trend of over-lending in recent years is the fact that the ratio of loans to savings exceeded 100% during the first half of the year. By the end of 2009, the Greek economy (based on data revised on 15 November 2010 in part due to reclassification of expenses) faced the highest budget deficit and government debt to GDP ratios in the EU. The 2009 budget deficit stood at 15.4% of GDP. This, and rising debt levels (127% of GDP in 2009) led to rising borrowing costs, resulting in a severe economic crisis. Greece was accused of trying to cover up the extent of its massive budget deficit in the wake of the global financial crisis. This resulted from the massive revision of the 2009 budget deficit forecast by the new Socialist government elected in October 2009, from "6-8%" (estimated by the previous government) to 12.7% (later revised to 15.4%). The Greek labor force totals 5.05 million, and on average work the second most hours per year among OECD countries, after South Korea. The Groningen Growth & Development Centre has published a poll revealing that between 1995 and 2005, Greece was the country whose workers worked the most hours/year among European nations; Greeks worked an average of 1,900 hours per year, followed by Spaniards (average of 1,800 hours/year). As a result of the on-going economic crisis, industrial production in the country went down by 8% between March 2010 and March 2011, while the volume of building activity saw a reduction of 73.1% between January 2010 and January 2011. Additionally, the turnover in retail sales saw a decline of 9% between February 2010 and February 2011. In the first weeks of 2010, there was renewed anxiety about excessive national debt. Some politicians, notably Angela Merkel, have sought to attribute some of the blame for the crisis to hedge funds and other "speculators" stating that "institutions bailed out with public funds are exploiting the budget crisis in Greece and elsewhere". Greece has been called one of the "PIGS" of peripheral Europe. On 23 April 2010, the Greek government requested that the EU/IMF bailout package (made of relatively high-interest loans) be activated. The IMF had said it was "prepared to move expeditiously on this request". The initial size of the loan package was €45 billion ($61 billion) and its first installment covered €8.5 billion of Greek bonds that became due for repayment. On 27 April 2010, the Greek debt rating was decreased to BB+ (a 'junk' status) by Standard & Poor amid fears of default by the Greek government. The yield of the Greek two-year bond reached 15.3% in the secondary market. Standard & Poor's estimates that in the event of default investors would lose 30–50% of their money. Stock markets worldwide and the Euro currency declined in response to this announcement. Japan, Italy and Belgium's creditors are mainly domestic institutions, but Greece and Portugal have a higher percent of their debt in the hands of foreign creditors, which is seen by certain analysts as more difficult to sustain. Greece, Portugal, and Spain have a 'credibility problem', because they lack the ability to repay adequately due to their low growth rate, high deficit, less FDI, etc. On a poll published on 18 May 2011, 62% of the people questioned felt that the IMF memorandum that Greece signed in 2010 was a bad decision that hurt the country, while 80% have no faith in the current Minister of Finance, Giorgos Papakonstantinou, to handle the crisis. 75% of those polled gave a negative image of the IMF, and 65% feel it is hurting Greece's economy. 64% felt that the possibility of bankruptcy is likely, and when asked about their fears for the near future, polls showed a fear of: unemployment (97%), poverty (93%) and the closure of businesses (92%). 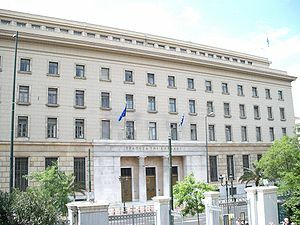 On 13 June 2011, Standard and Poors lowered the Greek sovereign debt to a CCC rating, the lowest in the world, following the findings of a bilateral EU-IMF audit which called for further austerity measures. After the major political parties failed to reach consensus on the necessary measures to qualify for a further bailout package, and amidst riots and a general strike, Prime Minister George Papandreou proposed a re-shuffled cabinet, and asked for a vote of confidence in the parliament. The crisis sent ripples around the world, with major stock exchanges exhibiting losses. Based on the IS-LM model, as the interest rate rose the Greek 10-year bond yields spread increased to 400 basis points in January 2010, which was at the time a record high. High bond spreads indicate declining investor confidence in the Greek economy. Despite increasing nervousness surrounding Greece’s economy, the Greek government was able to sell €8 billion in bonds successfully at the end of January 2010, €5 billion at the end of March 2010, and €1.56 billion in mid-April 2010, albeit at high interest rates. Piraeus is the largest port in Greece and one of the largest in the Mediterranean Sea. The Greek maritime fleet is the largest in the world, at approximately 18% of the world's maritime fleet, and the shipping industry is a key element of Greek economic activity dating back to ancient times. Today, shipping is one of the country's most important industries. It accounts for 4.5% of GDP, employs about 160,000 people (4% of the workforce), and represents 1/3 of the country's trade deficit. During the 1960s, the size of the Greek fleet nearly doubled, primarily through the investment undertaken by the shipping magnates Onassis and Niarchos. The basis of the modern Greek maritime industry was formed after World War II when Greek shipping businessmen were able to amass surplus ships sold to them by the United States Government through the Ship Sales Act of the 1940s. According to the BTS, the Greek-owned maritime fleet is today the largest in the world, with 3,079 vessels accounting for 18% of the world's fleet capacity (making it the largest of any other country) with a total dwt of 141,931 thousand. In terms of ship categories, Greece ranks first in both tankers and dry bulk carriers, fourth in the number of container ships, and fourth in other ships. However, today's fleet roster is smaller than an all-time high of 5,000 ships in the late 1970s. Greece attracts more than 16 million tourists each year, thus contributing between 15% and 25% to the nation's Gross Domestic Product. The number of jobs directly or indirectly related to the tourism sector were 867,200 in 2006 and represented 20% of the country's total labor force. In 2009, Greece welcomed over 19.3 million tourists. a major increase from the 17.7 million tourists the country welcomed in 2008. ^ a b "Gross domestic product 2009" (PDF). World Bank. 15 December 2010. http://siteresources.worldbank.org/DATASTATISTICS/Resources/GDP.pdf. Retrieved 15 January 2011. ^ a b "Gross domestic product 2009, PPP" (PDF). World Bank. 15 December 2010. http://siteresources.worldbank.org/DATASTATISTICS/Resources/GDP_PPP.pdf. Retrieved 15 January 2011. ^ a b c d "Greece". International Monetary Fund. http://www.imf.org/external/pubs/ft/weo/2011/01/weodata/weorept.aspx?sy=2008&ey=2011&scsm=1&ssd=1&sort=country&ds=.&br=1&c=174&s=NGDPD%2CNGDPDPC%2CPPPGDP%2CPPPPC%2CLP&grp=0&a=&pr.x=57&pr.y=16. Retrieved 27 May 2011. ^ "QUARTERLY NATIONAL ACCOUNTS: 1st Quarter 2011 (Provisional)" (PDF). Piraeus: Hellenic Statistical Authority. 9 June 2011. http://www.statistics.gr/portal/page/portal/ESYE/BUCKET/A0704/PressReleases/A0704_SEL84_DT_QQ_01_2011_01_P_EN.pdf. Retrieved 9 June 2011. ^ "CONSUMER PRICE INDEX: May 2011" (PDF). Piraeus: Hellenic Statistical Authority. 9 June 2011. http://www.statistics.gr/portal/page/portal/ESYE/BUCKET/A0515/PressReleases/A0515_DKT87_DT_MM_05_2011_01_F_EN.pdf. Retrieved 9 June 2011. ^ "17 % of EU citizens were at-risk-of-poverty in 2008". Eurostat. http://epp.eurostat.ec.europa.eu/cache/ITY_OFFPUB/KS-SF-10-009/EN/KS-SF-10-009-EN.PDF. Retrieved 25 May 2011. ^ "LABOUR FORCE SURVEY: March 2011" (PDF). Piraeus: Hellenic Statistical Authority. 8 June 2011. http://www.statistics.gr/portal/page/portal/ESYE/BUCKET/A0101/PressReleases/A0101_SJO02_DT_MM_03_2011_01_F_EN.pdf. Retrieved 8 June 2011. ^ a b "Wages and Taxes for the Average Joe in the EU 2" (PDF). http://www.langlophone.com/20100526_edition/20100526_EU27_data_table_flipped.pdf. Retrieved 2011-05-19. ^ "Ease of Doing Business in Greece". World Bank. http://doingbusiness.org/data/exploreeconomies/greece. Retrieved 15 January 2011. ^ a b "Imports-Exports of Goods and Services (Years 2000-2010)" (xml). EL.STAT.. 2010. http://www.statistics.gr/portal/page/portal/ESYE/PAGE-themes?p_param=A0702&r_param=SEL30&y_param=2010_00&mytabs=0. Retrieved 16 April 2011. ^ a b c d "Provision of deficit and debt data for 2010 - first notification" (PDF). Eurostat. 26 April 2011. http://epp.eurostat.ec.europa.eu/cache/ITY_PUBLIC/2-26042011-AP/EN/2-26042011-AP-EN.PDF. Retrieved 26 April 2011. ^ "Fitch - Complete Sovereign Rating History" (XLS). Fitch Ratings. http://www.fitchratings.com/web_content/ratings/sovereign_ratings_history.xls. Retrieved 9 June 2011. ^ "Moody's downgrades Greece to Caa1 from B1, negative outlook". London: Moody's Investors Service. 1 June 2011. http://moodys.com/research/Moodys-downgrades-Greece-to-Caa1-from-B1-negative-outlook?lang=en&cy=global&docid=PR_220046. Retrieved 9 June 2011. ^ "Sovereigns Ratings List". Standard & Poor's. http://www.standardandpoors.com/ratings/sovereigns/ratings-list/en/eu/?subSectorCode=&start=50&range=50. Retrieved 13 June 2011. ^ "Υποβάθμιση από S&P" (in Greek). Naftemporiki. 13 June 2011. http://www.naftemporiki.gr/news/cstory.asp?id=1993213. Retrieved 13 June 2011. ^ "International Reserves and Foreign Currency Liquidity - Greece". International Monetary Fund. 20 May 2011. http://www.imf.org/external/np/sta/ir/IRProcessWeb/data/grc/eng/curgrc.htm. Retrieved 31 May 2011. ^ a b "The Economist Intelligence Unit's quality-of-life index (2005)" (PDF). The Economist (www.economist.com). http://www.economist.com/media/pdf/QUALITY_OF_LIFE.pdf. Retrieved 2007-04-08. ^ "A Greek Odyssey: 1821-2201". Ekathimerini.com. http://www.ekathimerini.com/4dcgi/_w_articles_wsite3_11833_27/03/2011_384716. Retrieved 2011-05-19. ^ Eurostat, including updated data since 1980 and data released in April 2008</refref>"FIELD LISTING:: GDP – PER CAPITA (PPP)". The World Factbook. Central Intelligence Agency. https://www.cia.gov/library/publications/the-world-factbook/fields/2004.html. Retrieved 10 January 2010. ^ "REPORT BY EUROSTAT ON THE REVISION OF THE GREEK GOVERNMENT DEFICIT AND DEBT FIGURES" (PDF). 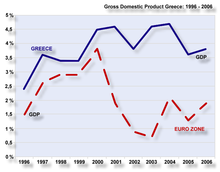 2004-11-22. http://epp.eurostat.ec.europa.eu/cache/ITY_PUBLIC/GREECE/EN/GREECE-EN.PDF. ^ "Finmin says fiscal data saga has ended in wake of EU report". 2004-12-08. http://www.hri.org/news/greek/ana/2004/04-12-08.ana.html#09. ^ "Human Development Index and its components". http://hdr.undp.org/en/media/HDR_2010_EN_Table1.pdf. ^ "GDP per inhabitant in purchasing power standards". Eurostat. 2009-12-15. http://epp.eurostat.ec.europa.eu/cache/ITY_PUBLIC/2-15122009-BP/EN/2-15122009-BP-EN.PDF. ^ "Premium content". Economist.com. 2008-12-09. http://www.economist.com/world/europe/displaystory.cfm?story_id=12756043&fsrc=rss. Retrieved 2010-04-28. ^ "Country rankings for trade, business, fiscal, monetary, financial, labor and investment freedoms". Heritage.org. http://www.heritage.org/Index/Ranking.aspx. Retrieved 2010-04-28. ^ "Report for Selected Countries and Subjects". World Economic Outlook Database, April 2011. International Monetary Fund. http://imf.org/external/pubs/ft/weo/2011/01/weodata/weorept.aspx?pr.x=64&pr.y=2&sy=1980&ey=2016&scsm=1&ssd=1&sort=country&ds=.&br=1&c=174&s=NGDP_RPCH&grp=0&a=. Retrieved 26 April 2011. ^ "Ζούμε με δανεικά" (in Greek). 2007-10-16. http://stocks.pathfinder.gr/news/560812.html. ^ "'Greece's economic crisis could signal trouble for its neighbors'". Washingtonpost.com. 2010-02-10. http://www.washingtonpost.com/wp-dyn/content/story/2010/02/09/ST2010020904032.html?hpid=topnews. Retrieved 2011-05-19. ^ Parmy Olson (21 May 2008). "The World's Hardest-Working Countries". www.forbes.com. http://www.forbes.com/2008/05/21/labor-market-workforce-lead-citizen-cx_po_0521countries.html. Retrieved 17 April 2011. ^ Groningen Growth & Development Centre, Pegasus Interactive (2008-10-06). "v4.ethnos.gr – Oι αργίες των Eλλήνων – ειδησεις, κοινωνια, ειδικες δημοσιευσεις". Ethnos.gr. http://www.ethnos.gr/article.asp?catid=12128&subid=2&tag=8784&pubid=1114536. Retrieved 2009-01-06. ^ "The Production Index in Industry recorded a decline of 8.0% in March 2011 compared with March 2010.". www.statistics.gr. http://www.statistics.gr/portal/page/portal/ESYE/BUCKET/A0503/PressReleases/A0503_DKT21_DT_MM_03_2011_01_P_EN.pdf. Retrieved 25 May 2011. ^ "Building Activity Survey: January 2011". www.statistics.gr. http://www.statistics.gr/portal/page/portal/ESYE/BUCKET/A0503/PressReleases/A0503_DKT21_DT_MM_03_2011_01_P_EN.pdf. Retrieved 25 May 2011. ^ "The Turnover Index in Retail Trade, excluding automotive fuel, recorded a fall of 9.0% in February 2011 compared with February 2010.". www.statistics.gr. http://www.statistics.gr/portal/page/portal/ESYE/BUCKET/A0508/PressReleases/A0508_DKT39_DT_MM_02_2011_01_F_EN.pdf. Retrieved 25 May 2011. ^ "Merkel Slams Euro Speculation, Warns of 'Resentment' (Update 1)". BusinessWeek. 2010-02-23. http://www.businessweek.com/news/2010-02-23/merkel-slams-euro-speculation-warns-of-resentment-update1-.html. Retrieved 2010-04-28. ^ Laurence Knight (22 December 2010). "Europe's Eastern Periphery". www.bbc.co.uk. http://www.bbc.co.uk/news/business-12040913. Retrieved 17 May 2011. ^ "PIIGS Definition". www.investopedia.com. http://www.investopedia.com/terms/p/piigs.asp. Retrieved 17 May 2011. ^ Bernd Riegert. "Europe's next bankruptcy candidates?". www.dw-world.com. http://www.dw-world.de/dw/article/0,,5515912,00.html. Retrieved 17 May 2011. ^ Nikolaos D. Philippas. "Ζωώδη Ένστικτα και Οικονομικές Καταστροφές" (in Greek). www.skai.gr. http://www.skai.gr/news/articles/article/158857/zoodi-enstikta-kai-oikonomikes-katastrofes-. Retrieved 17 May 2011. ^ a b Jack Ewing and Jack Healy (2010-04-27). "Cuts to Debt Rating Stir Anxiety in Europe". The New York Times. http://www.nytimes.com/2010/04/28/business/global/28drachma.html. Retrieved 2010-05-06. ^ Katie Martin and Terence Roth (2010-04-28). "S&P downgrades Greek debt to junk". Dow Jones Newswires. http://www.theaustralian.com.au/business/markets/sp-downgrades-greek-debt-to-junk/story-e6frg91o-1225859110788. Retrieved 2010-05-06. ^ "Greek credit status downgraded to 'junk'". BBC News. 2010-04-27. http://news.bbc.co.uk/2/hi/business/8647903.stm. Retrieved 2010-05-06. ^ "Greek bonds rated 'junk' by Standard & Poor's". BBC. 2010-04-27. http://news.bbc.co.uk/2/hi/business/8647441.stm. Retrieved 2010-05-06. ^ (Greek)"Fourth raft of new measures". In.gr. 2010-05-02. http://www.in.gr/news/article.asp?lngEntityID=1132263. Retrieved 2010-05-06. ^ a b Judy Dempsey (5 May 2010). "Three Reported Killed in Greek Protests". The New York Times. http://www.nytimes.com/2010/05/06/world/europe/06greece.html?src=me. Retrieved 5 May 2010. ^ Skrekas, Nick (2010-09-08). "Greek GDP Revised Down". Wall Street Journal. http://online.wsj.com/article/SB10001424052748703453804575479162284898390.html. Retrieved 2011-05-19. ^ "Public Debt by Country | Global Finance". Gfmag.com. http://www.gfmag.com/tools/global-database/economic-data/10394-public-debt-by-country.html. Retrieved 2011-05-19. ^ a b c "Mνημόνιο ένα χρόνο μετά: Aποδοκιμασία, αγανάκτηση, απαξίωση, ανασφάλεια (One Year after the Memorandum: Disapproval, Anger, Disdain, Insecurity)". www.skai.gr. 18 May 2011. http://www.skai.gr/news/politics/article/169875/mnimonio-ena-hrono-meta-apodokimasia-aganaktisi-apaxiosi-anasfaleia. Retrieved 18 May 2011. ^ "Athens concludes EU-IMF audit: finance ministry". msn.net. 2011-06-03. http://news.ph.msn.com/business/article.aspx?cp-documentid=4903548. Retrieved 2011-06-16. ^ "Global markets shaken by Greek debt crisis". AlJazeera.net. http://english.aljazeera.net/news/europe/2011/06/201161655151693509.html. Retrieved 2011-06-16. ^ "After the battle of Athens: Greek PM reshuffles government in desperate bid to force through austerity measures". Daily Mail. 2011-06-16. http://www.dailymail.co.uk/news/article-2003709/Athens-riots-Police-tear-gas-protesters-hurl-Greek-yoghurt.html. Retrieved 2011-06-16. ^ "Greek debt fears sink Wall Street, more losses eyed". Reuters. 2011-06-16. http://www.reuters.com/article/2011/06/15/us-markets-stocks-idUSTRE75512M20110615?feedType=RSS&feedName=businessNews&utm_source=feedburner&utm_medium=feed&utm_campaign=Feed%3A+reuters%2FbusinessNews+%28News+%2F+US+%2F+Business+News%29&. Retrieved 2011-06-16. ^ a b Polemis, Spyros M.. "The History of Greek Shipping". www.greece.org. http://www.greece.org/poseidon/work/articles/polemis_one.html. Retrieved 2007-04-09. ^ "Greek shipping is modernized to remain a global leader and expand its contribution to the Greek economy". National Bank of Greece. www.nbg.gr. 2006-05-11. Archived from the original on 31 August 2007. http://web.archive.org/web/20070831114031/http://www.nbg.gr/en/pr_release_resb.asp?P_ID=463. Retrieved 2007-04-08. ^ a b Engber, Daniel (2005-08-17). "So Many Greek Shipping Magnates ...". Slate (Washington Post/slate.msn.com). http://slate.msn.com/id/2124542. Retrieved 2007-04-09. ^ a b "Top 20 Ranking of World Merchant Fleet by Country of Owner as of 1 January 2001". Bureau of Transportation Statistics. www.bts.gov. 2001. http://www.bts.gov/publications/maritime_trade_and_transportation/2002/html/table_01_05.html. Retrieved 2007-04-08. ^ World Tourism and Travel Council study predicts great increase in Greek tourism, Embassy of Greece, 18 April 2007. ^ "Nights spent in tourist accommodation establishments - regional - annual data". http://epp.eurostat.ec.europa.eu/.+2010. http://appsso.eurostat.ec.europa.eu/nui/setupModifyTableLayout.do. Retrieved 19 May 2011. ^ "Tourism". http://epp.eurostat.ec.europa.eu/.+2010. http://epp.eurostat.ec.europa.eu/cache/ITY_OFFPUB/KS-HA-10-001-11/EN/KS-HA-10-001-11-EN.PDF. Retrieved 19 May 2011. Manolopoulos, J.. Greece's 'Odious' Debt: The Looting of the Hellenic Republic by the Euro, the Political Elite and the Investment Community.. London, May 2011: Anthem Press. http://greecesodiousdebt.anthempressblog.com. This page was last modified on 21 June 2011 at 21:22.